CNG: The Coin Shop. KINGS of PERGAMON. Eumenes I. 263-241 BC. AR Tetradrachm (29.5mm, 16.88 g, 12h). In the name of Philetairos. Pergamon mint. Struck circa 255/50-241 BC. KINGS of PERGAMON. Eumenes I. 263-241 BC. AR Tetradrachm (29.5mm, 16.88 g, 12h). In the name of Philetairos. Pergamon mint. Struck circa 255/50-241 BC. 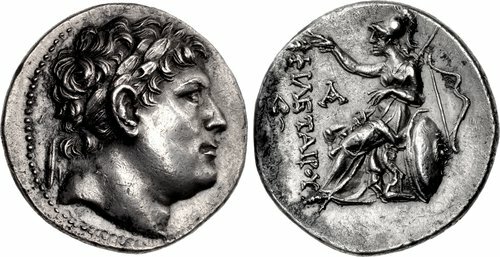 Head of Philetairos right, wearing laurel wreath / ΦIΛETAIPOY, Athena enthroned left, left elbow resting on shield to right, crowning dynastic name with wreath held in her extended right hand; transverse spear in background, ivy leaf to outer left, monogram to inner left, bow to right. Westermark Group IVA, obv. die XLVII; SNG BN 1610–6; SNG von Aulock 1356–7; SNG Copenhagen 335; Dewing 2208. EF, toned, some residual find patina, a few light marks.